Water is quite literally, the stuff of which life is made. Your body is between 60% and 75% water – but that only tells part of the story. Your brain, your heart and your muscles are made up of more than 75% water. Your lungs, liver, kidneys and blood each are made up of over 85% water. Your skin is over 60% water, and even your bones, which seem solid, are made up of over 20% water. It should come as no surprise, then, that even a minute drop in your body’s water content will affect your health and the functioning of every one of your bodily systems in major ways. Much has been written about the benefits of drinking water. If you’re dieting, exercising, an athlete or engage in any sort of active sports, chances are that your coach or doctor has made a point of telling you that you should be drinking at least 8 glasses of water a day. In fact, most medical and fitness authorities would tell you that 8 glasses of water a day is far too little. Water is of vital importance to your body, and keeping your body adequately hydrated is the single most important thing you can do for your health. There are reports from various studies that you can also count improved muscle function and reduced joint pain among the many benefits of drinking water. Water makes up the largest volume of your blood, lubricates your joints, helps your lungs filter impurities from the air and your kidneys filter impurities from your blood, and paradoxically – drinking water can relieve water retention. Adequate amounts of water help your body digest foods properly, and flush wastes from your system. The benefits of drinking water include preventing or relieving constipation, which in turn may reduce the incidence of colon cancer. According to many diet and weight loss experts, drinking adequate water is a vital part of a healthy diet and will help the body burn fat faster. Drink whenever you feel thirsty. Drink a cup of water with every meal. Drink at least one cup of water between meals. Drink 1-2 cups of water half an hour before exercising to prevent dehydration. Drink an additional cup of water per hour if you are engaging in physical activity. Would you like to learn more about amount of water to consume daily, visit our blog article How much water should you drink a day? The health benefits of drinking water are undisputed. 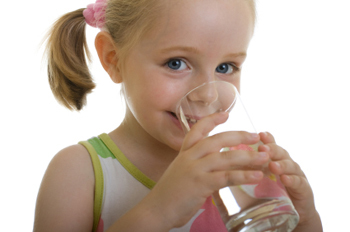 Keep your body hydrated by drinking to your health – water, and plenty of it.